BOSTON – With two big outs, Doug Concannon turned a dream into a reality. In front of a large Xaverian contingency at historic Fenway Park, Concannon entered out of the bullpen with a pair of runners in scoring position and the Hawks leading St. John’s Prep 3-2 in the top half of the seventh. 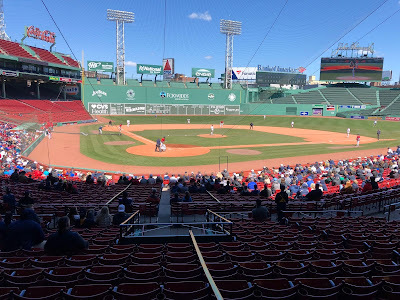 Concannon showed little signs of intimidation inducing a pop up to right field before picking up a strikeout on an outside fastball to give Xaverian a monster 3-2 win over their Catholic Conference rival Eagles on Saturday afternoon at Fenway Park. The game was played as part of the Pete Frates Home Health Initiative. Xaverian wore the number ‘70’ in honor of Brother Hoyt who graduated the school in 1970. St. John’s Prep, meanwhile, dressed in its red uniforms in honor of Pete Frates’ battle with ALS. Ace Owen Lagan got the start for the Hawks going four innings, allowing just two unearned runs and striking out seven. St. John’s Prep got to Langan in the top half of the first. Jacob Bolger singled to right, Tyler MacGregor walked, and Alex lane hit a hot shot that caromed off Hawks’ third baseman Matt Joyce and into left field to put the Prep up 1-0. Moments later the Eagles added to their lead as MacGregor crossed the plate on a passed ball to make it 2-0 Eagles. Langan, however, settled in after that striking out four in a row and allowing just two hits over the next four innings. “I just had to be mentally tough," said Langan. "Fenway Park, first inning I think everyone was a little uncomfortable. I just had to start pounding the zone, bear down, and be better than them." Xaverian scored all three of its runs in the bottom of the second to take the lead for good. A pair of walks put two men on, and Tevenan reached after a bunt back to the mound was thrown to third base with no avail. Chris Ducko came through with the key hit lining a single to left that was misplayed and rolled to the wall scoring all three runs to give the Hawks a 3-2 lead. The Eagles had a chance to tie the game twice. First in the top half of the fourth a walk and a Josh Cerritani base hit put two on with two out. The Prep then tried to score on a Bolger line single to left, but Hawks’ left fielder Sean Birch came up firing and threw a strike to Tevenan to get a bulldozing Richie Williams to keep Xaverian in front. Two innings later against Hawks’ reliever Justin Posnik, St. John’s Prep threatened again loading the bases with two men down. Posnik, however, induced a flyout to center off the back of MacGregor to escape the jam and send the Hawks into the seventh up 3-2.